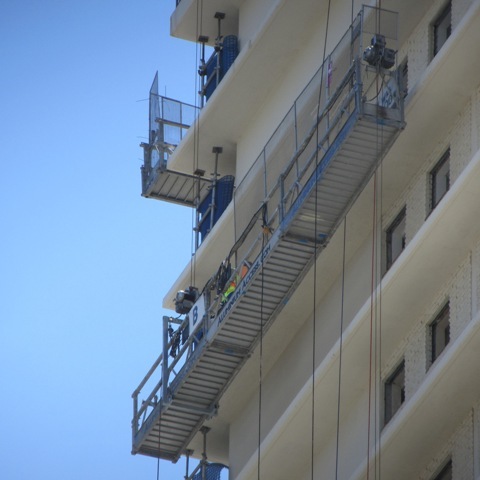 Aluminium Access Systems are currently supplying 2 and 3 motored Swing Stages to numerous high rises on the Gold Coast and Brisbane for the refurbishment and replacement of windows and balustrades. The Body Corporates are doing a fabulous job giving much needed TLC to iconic building throughout the Gold Coast, Brisbane and The Tweed. Regular renovations modernize and upgrade the buildings and keep them in tip top shape. The Principle contractors are doing a fantastic job with a minimum of fuss and inconvenience to the public with our help and experience. Swinging Stage Scaffolding is an ideal solution for Glass and Balustrade Replacement. Swing Stages are time efficient, versatile and allow the work to be carried out with a very little inconvenience to residents and guest. Aluminium Access supply stages that are fully compliant with Work Place Health and Safety requirements and can be made to suit any application required.